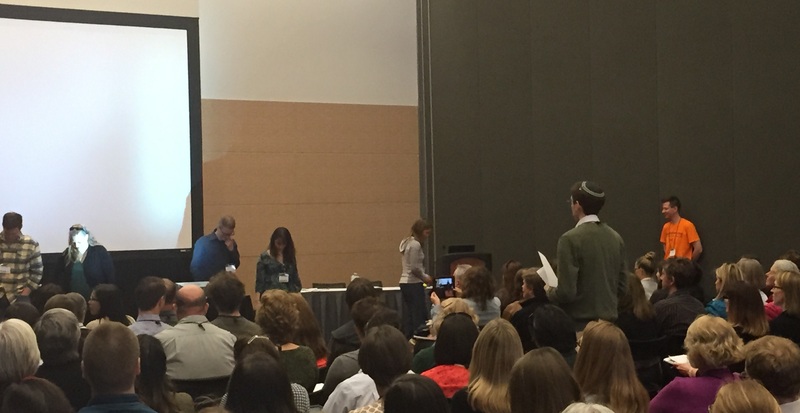 This past week the NCTM annual conference was held in Boston, and what an enriching epxerience! What made it so special this time around was meeting and hearing from my PLC of Twitter friends, many of whom I had admired from afar for some time. I’ll discuss the power of the MTBoS (Math-Twitter-Blog O’Spehere) in a later post. Today I want to focus on a powerful session I attended in Boston, and how a new persepective developed – even after a 2 year delay. The story starts 2 years ago at Twitter Math Camp in Philadelphia. At that conference, I participated in an Algebra 2 small group, facilitated by the super-creative Max Ray, from the Math Forum. Splitting into smaller groups, I worked with a team to think about rational expressions – a unit which is often dry as sand in Alg 2 courses, and where I thought we could make some head-way. While we worked on our slightly-less dry, yet safe lessons, Max and a small group were discussing complex numbers on the board. There were mysterious circles, transformations, and discussions I didn’t understand. I suppose I was taught about complex numbers the “traditional” way – we need them to solve certain quadratics and memrize some wierd rules about their behavior. We perform strange operations on them, and we definitely don’t ask why. I suppose I could have simply wandered over to the group and found out more, but the mathematical intimidation factor was high – I’m sometimes too proud to admit what I don’t know. Fast forward 2 years, and I see Max is presenting a session with Michael Pershan. This is a must-attend. Two engaging speakers whom I appreciate for their ability to use students’ natural curiosity to facilitate math conversations. Here’s the set-up: Michael finds a handful of volunteers to stand at the front of the room, standing on a hypothetical number line (Max stands at zero). The participants are then asked to consider the following transformations to their value, and move accordingly, returning after each move to their original position. Add 2 to your value – participants all move to the right 2 spaces. Multiply your value by 3 – participants all move to the left or right accordingly, depending on whether their original value is positive or negative. Multiply your value by -1. OK, now the plot thickens. While we can find our new position, Michael does a materful job in having participatins reflect upon the transformation. The first two moves required left and right shifts; here we need to consider a rotation about the origin. This rotation provides a rule for multiplication by a negative. The table has been set, the silverware polished. and now we need some new volunteers. We have a new number line, and some new transformations to think about. BUT this time around we want to complete our movement by using the same transformation twice. Let’s roll! First, add 4 by using the same transformation twice. This is a nice appetizer – let’s move 2, then 2 more. Next, multiply by 9. This is a little trickier, as some folks almost crashed into the next presentation room. But two multiply by 3 moves do the job. Now, multiply by 5. Oooh….we have an entry point into radicals. Some quick discussion, and we two moves – multiplying by a little mroe than 2 each time. Finally, multiply by -1…in two moves….. WAIT! This is the stuff Max was talking about 2 years ago that I didn’t get. The bulbs have gone off. I GET this now! We do a 180 degree rotation do perform a multiplication by -1, so now we need two 90 degree rotations. And now we have an entry point into imaginary numbers, without the scary-sounding term. What I appreciate most here is that we don’t need to wait until deep into algebra 2 to think about the imaginary unit. These concepts are accessible to younger students, and we have a responsibility to achieve some conceptual buy-in before just thrusting abstract ideas in front of our students. You can find Michael and Max’s shared files here on their Teaching Complex Numbers page. I get it now…I think….and I’m not ashamed to say it took me 2 years. UPDATE: You need to immediately run to check out the fun summary Ashli has provided of this session. Her notebook sketches are unreal (in the non-numbr sense)!